( Standard ) – Start from the start, travel as far in as you can. ( Shuffle ) – Oh no! Space/time has gone higgledy-piggledy. Play through levels in random order. ( Survival ) – Same as standard but you only get one life. Make it count. ( Seed ) – Everyone in the world gets the same set of levels, which changes once a day. Replay the day’s levels as many times as you want to compete for highscores. ( Arena ) – Trapped! There’s just one big level. There’s no door. 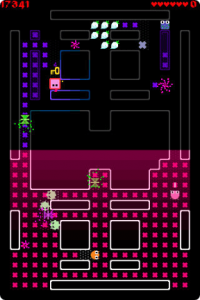 Enemies keep appearing, flowers keep being replenished, the walls keep being blasted away. Oh, and you only get one life. Original – Like Forget-Me-Not 1.0. Arcade – Harder! Faster! Scarier! Requires iOS 3.1 or later.